Hours for Upper Elementary Full Day classes are 8 AM – 2:30 PM. The Upper Elementary classroom is a multi-age environment covering 4th to 6th grade. 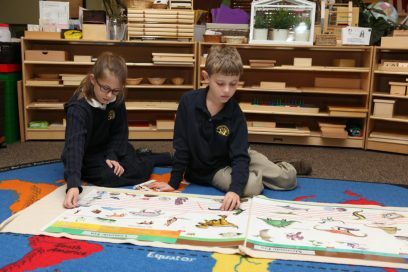 It is a sequenced learning environment, filled with beautiful Montessori materials as well as traditional learning resources like a library, computers, tablets, and other supportive technology. The Upper Elementary environment has a strong emphasis on time management skills. Students are taught to manage their time with daily, weekly, and long-term plans and projects. Each day, cooperative learning and care for the environment is expected. A majority of the class time is student work time, where students can concentrate and explore a variety of topics. Students are expected to do most of their work at school, with the exception of a few projects. Students are given daily homework to help reinforce lessons from the week. Students will be given the chance to develop their public speaking skills by speaking in front of the class, other classes, and parents and teachers. Public speaking is a very important skill to master, and the more practice a child gets speaking in front of people, the easier it becomes. Students will also be responsible for completing written reports based on their research using appropriate internet resources as well as print material. Long-term projects are customized for each ability level. Students do oral reports of their completed projects to the class, other classes, as well as the parents. Some work is collaborative, encouraging teamwork and cooperation, and some work is individual, fostering a sense of independence and autonomy. Language Arts in the Upper Elementary class is a time to delve deeper into the different parts of speech, rules of grammar, reading, literary devices, literature, and poetry. It is also when the students begin writing their own original poems and stories. The students begin working on reading comprehension and word study skills, as well as more advanced rules of spelling and etymology. Upper Elementary Mathematics is when the students take the concepts they have learned in the Lower Elementary classes and apply them to more advanced mathematics. Some Montessori math materials are used to encourage higher level thinking; however, this is the period when students make the bridge from concrete to abstract. The main areas of mathematics in the Upper Elementary classroom are: Fractions, Whole Numbers, Geometry, Pre-algebra, and Integers. In the Upper Elementary classroom, culture lessons focus on Physical Geography, Cultural Geography, Astronomy, Ecology, World History, U.S. History, Scientific Method and Technology, Health Science, Zoology, Botany, Microscopic Study, and Matter and Energy. In addition to the culture lessons, students work on Critical Thinking Skills, Coding and Robotics, Art, Music, and P.E. Please click here for an overview of the Upper Elementary Curriculum.